At 7:15pm this evening a large crowd from the Far Rockaway, Five Towns and surrounding areas will be joining at the White Shul for an uplifting gathering in light of the current crisis in Eretz Yisroel and in memory of the three kedoshim who were tragically killed several weeks ago HY"D. There will be numerous Rabbonim, organizations and institutions joining together in an unprecedented display of achdus. 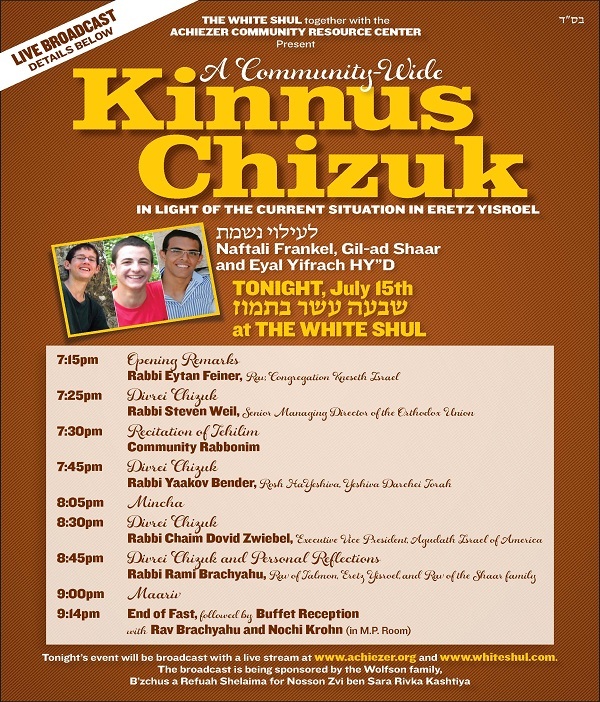 Additionally, there will be a world-wide broadcast which will be available at both www.achiezer.org and www.whiteshul.com. This broadcast is being sponsored by the Wolfson family b'zchus a refuah shelaima for Nosson Tzvi ben Sara Rivka Kashtiya who desperately needs our tefillos. May Klal Yisroel know of no more sorrow.